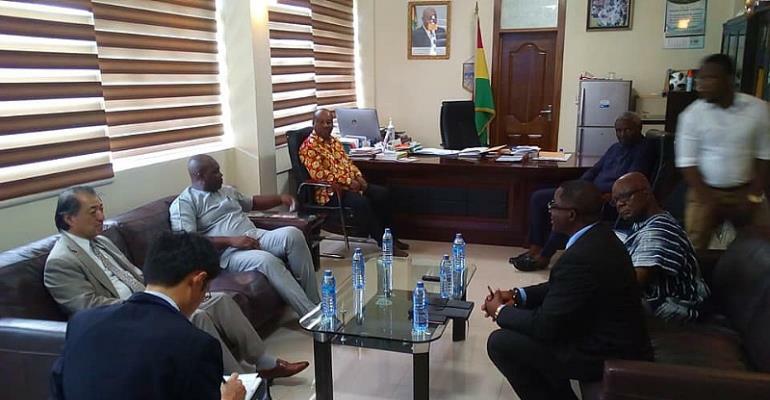 It was a brilliant spectacle to behold inside the corridors of the Ministry of Youth and Sports when the Honourable Sports Minister, Isaac Asiamah together with the Ghana Olympic Committee Ben Nunoo Mensah welcomed His Excellency the Japanese Ambassador to Ghana Mr Himeno to the office. Amongst the high powered dignitaries present were ; the Honourable Sports Minister , Isaac Asiamah, Deputy Sports Minister, Mr. Perry Okudzeto, the GOC President, Mr. Ben Nunoo Mensah, Mr Owusu Ansah of the Sports Ministry, the Chief Director, GOC deputy secretary, Rev Quarcoo, President of Ghana Baseball Albert Mensah amongst others. The Sports Minister, Mr. Isaac Asiamah in his submission, implored the Japanese Ambassador to assist in the completion of the Amasaman Project which he believes, if done, would be a legacy to the Japanese Government as a discharge of their social responsibility. Honourable Asiamah mentioned that as Tokyo is drawing closer a delegation would be inspecting GHANA'S camp village in Inawashiro, Japan in May. He again stressed that the pre-training is relevant for Team Ghana to adapt and acclimatize as the country still keeps yawning for a Gold medal in Tokyo. The affable sports Minister praised the Japanese outfit for putting out a baseball pitch at the Labone Secondary school. The Ambassador mentioned that the best time for the delegation to inspect the facility would be in the month of May as the month of April will be a busy one in Japan. The Ambassador explained that for the first time in Japanese history, Parliament has passed a law to allow the Emperor to resign- adding three more holidays to the Japanese calendar. His Excellency, Ambassador Himeno enquired about team Ghana's contingent and how they are preparing for the Games especially boxing. The Sports Minister again implored on the Japanese Ambassador to assist team GHANA'S participation by engaging Japanese companies in the country to support the dream vision. The GOC President Mr. Ben Nunoo Mensah was very optimistic of Black Meteors qualification to Tokyo 2020 adding they are a potential medal hopeful. In his closing remarks, the Japanese Ambassador appreciated the reception of this very important meeting and stressed on how the city of Inawashiro is waiting to welcome Ghana. The collaboration between the GOC and the Ministry in ensuring a successful Olympic participation is tremendous and it would be no surprise to see Ghana sweeping medals at the Games. The Ghana Olympic Committee has been extremely proactive in the quest for Ghana to win Gold at the Games. And that direction has been supported by the Ministry be of Youth and Sports immensely. Meanwhile, all prospective federations wanting to make it to Tokyo have began qualification plans and by mid-May next year that calendar will be over.